When GE announced the move of its headquarters to Boston in early 2016, nonprofits of all sizes and causes (including many arts organizations) immediately started thinking about how to capture the attention of what would certainly be an impactful corporate donor. Initially, GE announced a $50 million series of grants for schools, job training, and healthcare, with a focus on public schools and underrepresented groups. More recently, Ann Klee, the head of the GE Foundation, revealed a $15 million commitment to fighting the opioid crisis in Massachusetts. 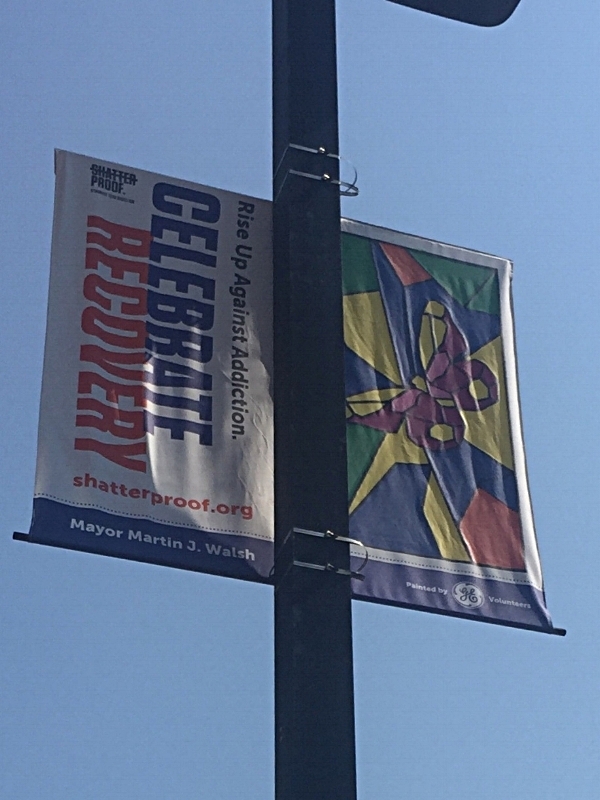 On the heels of this announcement I noticed a new set of banners along Tremont Street in Boston's South End, the same neighborhood that houses one of the City's biggest methadone clinics. You have to look closely to see it, but in the bottom right hand corner you'll notice that the image featured in the banner was "painted by GE volunteers." Pretty subtle, but definitely effective, and I'm intrigued by what looks like a three-way partnership between Shatterproof, a nonprofit fighting the opioid crisis, the City of Boston, and GE. But the fact that GE's contribution here is purely visual and features art by company volunteers (as you can imagine), is what really caught my eye. They're engaging their employees in their community efforts in a completely unconventional way - which makes sense, because the ways for employees to volunteer in corporate efforts to ameliorate the opioid crisis have to be limited. All of this makes me think about what medical companies will do from a CSR perspective on this front. And after reading the piece in this week's New Yorker on how the great art philanthropists, the Sacklers, profited from the development and deceptive advertising of OxyContin, I'm also thinking about the responsibility of the art institutions that benefited from the family's generosity (Harvard Art Museums, The Met, etc). Do these institutions have a responsibility to play a role in a crisis that seems so far removed from their missions and activities? My prediction is that we will start to see more and more companies and nonprofits taking a stand on this issue, even if they are unexpected participants.